Further to my comment on picture #544, here is the photo kindly supplied by James Brown. I'm also grateful to Martin Findlay for copying it for me. I imagine that either immediately before or after the other picture was taken, they all traipsed down to Miss Sinclair's studio in King Street and got their gowns on for this one. 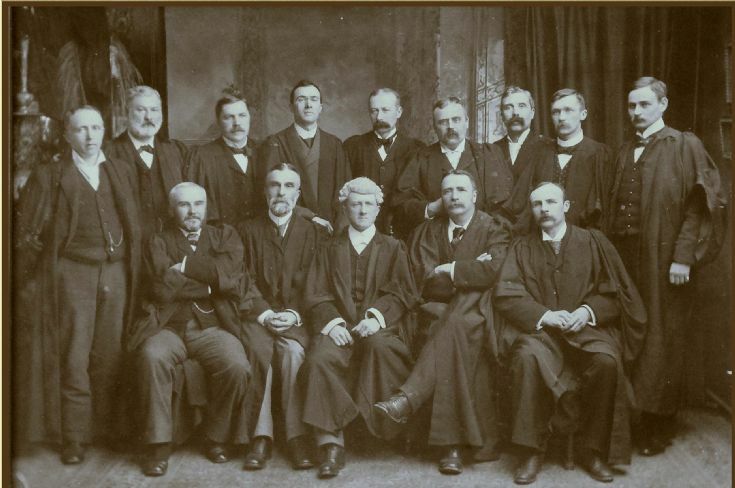 Standing, left to right, Duncan J Robertson of Macrae & Robertson, County Clerk, Poet and Naturalist and sometime owner of Eynhallow; John S. Copland, Stromness; W. J. Heddle of Drever & Heddle, later Town Clerk of Kirkwall; Martin L. Howman, Procurator Fiscal, later Fiscal at Perth; Thomas W. Ranken, Sheriff Clerk; Thomas H. Liddle of Buchanan & Liddle; William D. Firth, Stromness; Thomas Peace Low, who later went into partnership with his elder brother John Lees Low; and James Begg S.S.C., who became Fiscal in succession to Howman. Seated, left to right, W. P. Drever of Drever & Heddle, author of works on Udal Law and sometime proprietor of the estate of Rapness in Westray; William Cowper, Town Clerk of Kirkwall who retired shortly after this when his hearing failed; Samuel Beveridge Armour (later Armour-Hannay), Sheriff-substitute, author of the standard work on valuation for rating, now in its umpteenth edition; Angus Buchanan of Buchanan & Liddle, Agent for the National Bank, sometime rugby internationalist and credited with reviving golf in Orkney; and J. A. S. Brown, Town Clerk of Stromness. Can anyone tell me more about this James Begg. Is this possibly my great grandfather, Jame Alexander born on Eday/Pharay in 1823? second thoughts - silly me, this man is obviously not in his senventies Arithmatic and the birth date rules out this being my GGrandfather - possibly a ggUncle. Does anyone know who his father was? James Begg had a daughter, Marjory, who, I understand, married a Norwegian who became a Quisling during the Second World War. Marjory lived in the mountains close to Voss and used to make regular trips to Orkney in the 1960s and 70s. Thank you to each of you for answering me! Every clue helps. Sone of my Begg family came through Ontario, to Dakota and settled in the west coast - Washingon, Oregon and Califonrina.